COLLINGWOOD has a rich tradition of producing precocious teenagers who have played well before their birth certificates might otherwise have indicated they should. Some have graduated into genuine Magpie stars; others flourished for a period but couldn’t maintain their careers at the elite level. For a time, powerfully-built forward/utility Terry Keays looked like being one of the former. Yet, as it turned out, his 20 games in black and white across four senior league seasons never quite turned that early promise into something more lasting. His grandfather, Fred, played three games for Collingwood in 1922, as well as five with Fitzroy, an achievement in itself given he had been wounded twice in World War One. Terry was only 13 when Fred died, in 1983 – the same year the teenager first came to Collingwood’s attention after dominating his early years with St Mary’s in Greensborough. He stood out – in size, strength and skills – as he rose through the Magpie development squads, playing in the under 19s as a 15-year-old, and playing a key role in Collingwood’s premiership side in the under 19s a year later alongside the likes of Gavin Brown, Mick McGuane, Gavin Crosisca and Damian Monkhorst. He appeared to be just as talented as a young cricketer, too. With the Magpies eager to promote youngsters at the time, it seemed only a matter of time before he played senior football, given his powerful frame and his prodigious talent. That happened in Round 4, 1987, just 13 days before his 17th birthday, when Keays made his debut against Richmond in a memorable match. He would be the last of 13 Collingwood players to have debuted as either a 15-or-16-year – a rare group that included the likes of Albert Collier, Len Fitzgerald, Des Fothergill, Thorold Merrett and Rene Kink. Wearing No.60, Keays didn’t look out of place, and the Magpies believed he would be able to play in a host of positions, including in attack, on the wing or even in defence. In a team that had eight players yet to play 10 games, Keays had 15 disposals in his first game as Collingwood overcame a 39-point three-quarter-time deficit to win by 10 points. A week later against Footscray, he had 24 possessions and was one of his team’s best players. A brilliant career loomed. Keays, who stood at 186cm and weighed 85kg, was fast, strong and extremely talented. He could break packs with his full-on attack on the footy, kick the ball a mile and wasn’t afraid to hurl his big frame into the air for the occasional speccie. He also loved a goal, too. All the early signs were that his outstanding junior form would translate smoothly into a long senior career. He kept his spot in the seniors for seven consecutive weeks in 1987. Incredibly, he had the rare distinction of playing league football and Teal Cup (national under 18s championships) in the same year. Keays captained Victoria’s successful Teal Cup side in 1987, with his coach Ray Jordon describing him as one of the best young footballers he had coached at the level. Keays later described himself as “young, raw, didn’t care and had no fear” as his debut season resulted in 10 games and six goals. It seemed as if he had the football world at his feet. But his opportunities began to dry up almost immediately after that breakthrough first season. Other young Magpies pushed ahead of him after he battled an illness through part of his second season and there were also question marks on his attitude at times, though he remained a prolific goalkicker in the reserves. He could manage only one senior game in 1988 – this time in the No.31 jumper – having only six disposals and limited game time against Footscray in Round 8. 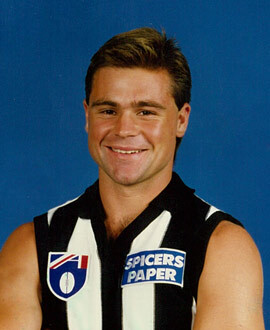 He couldn’t secure a permanent spot in Collingwood’s 1990 side, despite playing six games for the season, including a career-best three goals against St Kilda in Round 18. By that stage, he figured he wasn’t going to be a part of Leigh Matthews’ plans for the finals, or looking ahead to the future. Keays recalled in 1991: “I felt as though I’ve been languishing in the reserves and every now and then filling up spaces in the ones. I’d played 80 reserves games … and I couldn’t see anything changing or myself fitting into the structure of the team. “I don’t think I was given some chances I sometimes deserved. (But) I’d been there for four years. I was playing with guys like Mick McGuane and Gavin Crosisca in the under 19s. They’ve progressed and I’ve hung back. Keays had been approached by Richmond coach Kevin Bartlett and knew he needed a fresh start. He resigned his position as a Collingwood development officer, and was traded to Punt Rd in 1991, where he played 16 games and kicked 27 goals, including a career-high seven against Footscray. But, after Bartlett was sacked, he fell out of favour with new coach Allan Jeans in 1992, and despite good form in the reserves, played only nine senior games that season, taking his overall tally to 45 games. His AFL career was over at 22. After stints with Frankston, in Tasmania, with Lalor and Echuca, he retired from the game when he was 26, and remained convinced if he hadn’t pushed so early, he might have enjoyed a more sustained time in the game.